The Cuban population has grown significantly during the twentieth century, from about two million people in 19071 to over an estimated eleven million people as of June 30, 2000.2 This more than five-fold increase has been accompanied by a gradual but monotonous aging of the population in which the proportion of children and younger adults have decreased while the proportion of adults at older ages have increased. This aging has been the result of a decrease in the annual number of births accompanied by the lengthening of life expectancy as evidenced by the greater proportion of elderly. This process is expected to accelerate in this century, resulting in an increase of nearly 60% in the number of persons age 60 and older, and a 20% decrease in those younger than age 15, by the year 2020. Needless to say this demographic restructuring will result in a realignment of Cuba’s socio-economic needs regardless of the political ideology of the Cuban government twenty years from now. This paper examines the Cuban demographic transition during the twentieth century using three main published sources: (1) the national census statistics; (2) the population estimates produced by the Oficina Nacional de Estadísticas (ONE) and published by the Ministerio de Salud Pública (MINSAP); and (3) the projected population estimates published by the Centro Latinoamericano y Caribeño de Demografía (CELADE). The latter are used to establish a model of social costs as a percentage of total wages for the next twenty years focusing on the expenditures for education, public health, and social security pensions. This model can be used to determine the relative impact of changing per capita social expenditures and the average level of wages. The starting point for this financial model is the year 2000, for which both CELADE-estimated population figures and expenditures for social programs from the 2000 Cuban government budget are available. The Cuban population in the last century was directly tabulated in seven censuses in 1907, 1919, 1931, 1943, 1953, 1970, and 1981. Since 1981, the Cuban population has been measured by the monitoring of vital statistics by the Cuban government. The census information provides snapshots of the population within the statistical limitations of each census exercise. Nonetheless the census information is probably the best source for measuring the changes in the number and the characteristics of the national population for a particular period. 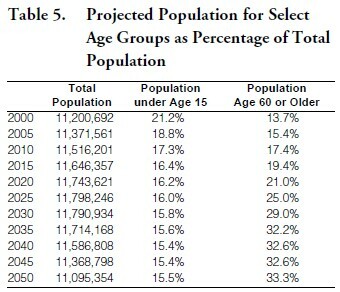 Table 1 shows the changes in the total population, and the percentage proportion of two age groups in each census. Table 1 shows the significant increase in the Cuban population during the twentieth century. This process accelerated through the 1970 census, when the average annual increase since the previous census reached its maximum value at more than twice the inter-census annual increase of the first period, 1907 to 1919. The Cuban population under age 15 usually amounted to about 36% of the total population except in the 1919 census, when it reached a maximum proportion of 42.3%. The population age 65 or older has more than doubled as a proportion of the total population between 1907 and 1970. The first trend can be explained by an increase in the number of live births combined with an improvement in infant and children’s mortality. The second trend can be attributed to improvements in longevity. It should be noted that the Cuban population experienced a significant decrease due to emigration in the period between the 1953 census and the 1970 census. Nonetheless during this period, it is when it grew at the highest average annual rate. The period between the 1970 and 1981 censuses shows a deceleration in the rate of growth accompanied by a decrease in the proportion of the younger population, and a significant increase in the proportion of the older population. This is a period, except during the year 1980, of relatively little net migration from Cuba so these trends can be attributed to the lowering in the number of births, relative improvement in longevity, or a combination of both trends. The 1981 census shows the Cuban population with three times the proportion of people age 65 or older than was measured in the 1907 census, and with the lowest proportion of young people of any census in the last century. There has been no national census of the Cuban population since 1981. The next census has been scheduled for 2002. Until the results of that census become public, any discussion of the Cuban population in the last twenty-one years will have to rely on estimates based on vital statistics collected during the period 1981-2000. The MINSAP has published such estimates in its annual statistical yearbooks based on information provided by the ONE. 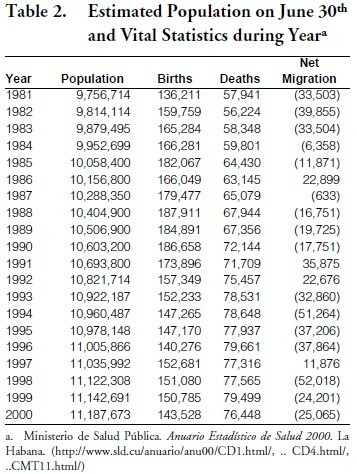 These population estimates, together with the number of births, and deaths in each year and net annual migration figures calculated by the author, are reproduced in Table 2. Table 2 shows that the number of births, after experiencing an increase during the 1980s, stabilized at between 140,000 and 150,000 births per year. Meanwhile, the number of deaths monotonically increased since the last census, reaching a level that is over half the number of births. Net migration was calculated as the remainder required to match the population estimates as of June 30th; and it shows immigration to Cuba in four annual periods ending on June 30th of 1986, 1991, 1992, and 1997. The average annual increase during the period from June 30th, 1981 to June 30th 2000 is 75,314 additional people, 25% fewer than the average annual increase during the period between the 1970 and the 1981 census. The above population estimates are consistent with the demographic experience between the 1970 and 1981 censuses, when the population grew at a slower pace than in previous inter-census periods, the proportion of younger people decreased, and the proportion of those at older ages increased. The decrease in the number of births will result in a smaller proportion of younger people in the future. The increase in the number of deaths is associated with the aging of the population, absent a mortality shock due to a sudden increase in lethal disease, or a sudden famine, both of which were absent during the period analyzed. The net migration figures for the annual periods ending June 30th 1986, 1991, 1992, and 1997 contradict the common expectation that since 1959 Cuba has always experienced net emigration of its inhabitants to other countries, mainly the United States. The net migration figures for these years may be the result of faulty estimation techniques by ONE, and they should not be given great credibility in the absence of direct migration statistics. The consequences of the described scenario of a decrease in the number of births accompanied by increased longevity of the older population is illustrated in the ONE’s estimates in Table 3. ONE has estimated that the proportion of younger and older people have stabilized at 22.2% and 12.9%, respectively, of the total population by the year 2000. The proportion of the population under age 15 is estimated to have decreased from the 26.7% of the total population according to the 1981 census to 12.9% of the total population by the end of the century. This proportion is about 60% of its level during most of the last century. The proportion of older population cannot be directly compared to the census figures in Table 1, but it can be deduced that it has increased from the 1981 census level. The future evolution of the Cuban population can only be estimated based on past trends and reasonable assumptions. CELADE has recently published a complete set of population projections by single ages for Cuba for each year in the period 1950-2050.3 CELADE’s population projections are based on a methodology developed by this institution and the resulting total population figures track closely both the census figures for 1970 and 1981, and the ONE’s population estimates for June 30th, 2000 as shown in Table 4. The CELADE population projections for Cuba continue the last century’s trend toward fewer births, and increased longevity. According to CELADE’s projections, the Cuban population will continue to grow very slowly in the first twenty-seven years of the twenty-first century, and then it will experience a slow contraction that continues through the end of the projection period. The CELADE projections continue the decline in the proportion of younger people, and the increase in the proportion of older people that has been experienced by the Cuban population since 1970. 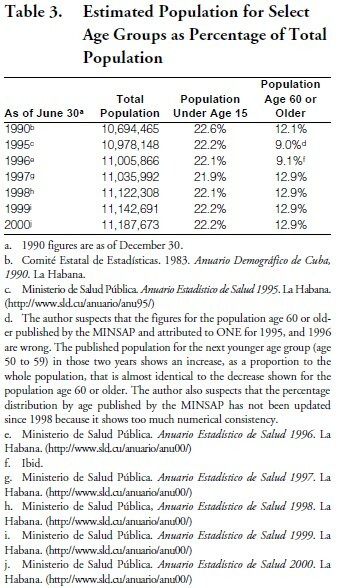 This estimated aging of the Cuban population is detailed in Table 5 for the age groups examined previously. Table 5 illustrates the dramatic shift projected for the Cuban population by the year 2050. If these projections come true, Cuba will have about one third of its population above the social security retirement age for males, triple the current proportion of the population at those ages. The under age-15 population proportion will be reduced by more than half from its historical level throughout much of the twentieth century. These dramatic trends can be dismissed as the results of mere arithmetical exercises due to the inherent problems in estimating the size and structure of a population fifty years into the future. A modest increase but steady increase in births, or a small but steady increase in mortality, could easily change the above results. A thorough discussion of the effect of these and other factors on these population estimates is beyond the scope of this paper. Nonetheless a meaningful discussion of the effect of the expected trend in the Cuban population can be conducted by limiting the projection period to the first twenty years of the century. There are a series of economic variables that can be modeled as a function of age, such as the expenses for primary education, which can be estimated by multiplying the average per-capita cost by the estimated number of children in primary education ages. This paper proposes that such a model can be developed to estimate future expenditures in education, health, and pensions, as well as to model total wages in Cuba. CELADE’s estimates of population by single ages provide the population counts required for such a model. However, the lack of detailed costs by age cohorts for Cuba limits the accuracy of such a model. Due to the latter, this paper limits itself to outlining a possible model using limited budget information obtained from the official 2000 budget of the Cuban government.4 The resulting model provides a framework for analyzing the likely evolution of social expenditures in the next twenty years if they are largely driven by demographics. The model can also be used to simulate the effect of changing the per capita expenditures due to social policy changes. The CELADE’s population projections permit the creation of four major demographic groups that are associated with particular social expenses, or economic activities: pre-school age population, population of school age, economically active population, and retired population. One of these groups, school age population, is further divided into four subgroups to reflect the different expenditures per capita associated with different educational ages. 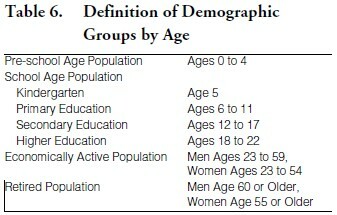 Table 6 summarizes the ages used for defining each of these groups. 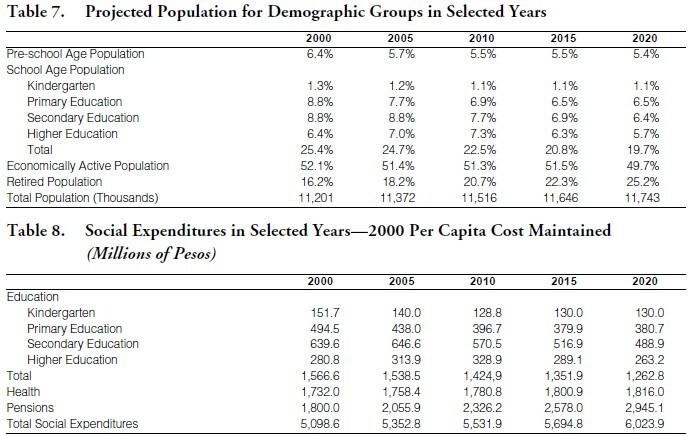 Combining the above demographic group definitions and the CELADE population projections results in the distribution of the Cuban population during the period 2000-2020 shown in Table 7. Thus, Table 7 shows a steady decrease in the proportion of the total school age population, and this is true for each subgroup in that category with the exception of the higher education age population which increases through 2010 and then joins the other subgroups in a steady decrease. The proportion of the population that is economically active decreases 5% during this period, while the retired population increases 56%. Finally it should be noted that this population projection assumes that the total population will increase by about 0.5 million people over 20 years. If one were to assume that the per capita expenditures derived from the 2000 budget of the Cuban Government were to be maintained during the modeling period, one can project future expenditures as shown in Table 8. According to data in the table, if per-capita expenditures are maintained at the 2000 budget levels, one would expect to see a significant increase in pensions driven largely by the aging population. There will also be a substantial reduction in educational outlays while health expenditures grow slowly with the increase in the total population. This assumes that there is no correlation between age and health expenditure per capita. The above health expenses would increase over time more dramatically if morbidity is assumed to increase with age. Table 9 below shows the effect on health expenses of changing the non-age-related morbidity assumed for Table 8 to a simple age-related morbidity. This age-related morbidity assumes that children under 15 have health expenses of half the cost of adults age 15 to 59, and that adults age 60 and older have health expenses at twice the level of the adults age 15 to 59. The age-related morbidity scale assumed for Table 9 is not based on any actual health cost data, and it is used for illustrative purposes. It is derived from a general concept that health expenditures for children are a fraction of those for adults of working age, while older adults can be expected to have greater health expenses related to the onset of chronic illnesses and deteriorating diseases. The construction of an actual age-related morbidity scale is beyond the scope of this paper. Another variable that could be modeled demographically is the level of total wages. The total wages for the year 2000 can be estimated at 9,833.3 million pesos using the 2000 Cuban government budget estimate of social security contributions of 1,180 million pesos5 and the mandated social security contribution rate of 12%.6 The total wages in any future year can be estimated by multiplying the year 2000 total wages by the ratio of the economically active population in the future year to the economically active population in 2000. This methodology reflects an economy where the level of unemployment remains constant in the future, and average wages do not increase. These projected total wages can be adjusted to reflect changes in average wages, and in the level of labor force utilization. This is accomplished by scaling the projected total wage in a given future year by the ratio of average wage, and labor force utilization in the projection year to the average wage and labor force utilization in the year 2000. Table 10 illustrates the estimated total wages under two possible scenarios: the 2000 Budget Scenario, and the 5% Wage Escalation scenario. Wages and labor force utilization are assumed to remain at the 2000 budget level under the former, while total national wages are expected to increase at an annual rate of 5% under the latter. Total national wages are expected to commence a slow decline in the year 2020 due to the shrinking available labor force assuming no change in average wages, or labor force utilization. This decline can only be reversed by an increase in average wages, or an increase in the labor force utilization as under the 5% Wage Escalation. In other words, national total wages will stagnate and then decline in the absence of an increase in labor productivity, or the increase in the size of the labor force. The feasibility of financing the social expenditures projected in Table 8 can be measured by the ratio of social expenditures to total national wages. This is illustrated in Table 11 for the two wage scenarios in Table 10 assuming health costs are not related to age, that educational and health costs increase in line with wages, and that future pensions reflect the wage increases prior to the retirement year. It is clear that the financing of social expenditures will place additional burdens in the Cuban economy in the absence of increases in real wages as shown in the 2000 Budget Scenario. Pensions, which are currently partially financed through a tax on wages paid by employers, would require an increase in the contribution percentage from the current 12% to nearly 30% just to pay old-age pensions. Educational expenses are reduced over the projection period but this may not be realistic if there is a need to increase productivity through adult education, re-training, and additional studies. Health expenditures are probably understated because there is no additional cost associated with the aging of the population. If there are additional health needs related to the aging of the population, the health expenditures shown above describe a situation where the health needs of the elderly population are not met. The 5% Wage Escalation Scenario is based on the assumption that both education and health expenditures increase in line with the increase in national wages. This situation is likely to occur if there is a will by the government to maintain the wages of educators and health personnel in line with the general increase in wages, and there is a relatively modest but steady increase in capital expenditures for the education and health sectors. The decrease in the ratio of pensions as a percentage of wages is due to the absence of indexing for pensions. The 5% Wage Escalation Scenario reflects a drop in the real purchasing power of pensions of 5% per year. This is not sustainable in the long run and specially in a political climate subject to the political and social pressures of over a quarter of the total population. Indexing pensions to keep pace with the increase in wages will invariably result in additional financial pressure as shown in the following table for three pension indexing scenarios: no pension indexing, pension indexed at half the average annual wage increase rate (2.5%), and pensions indexed at the same rate as average wages (5.0%). Table 12 shows that fully indexing pensions at the same rate as average wages increase results in the same level of expenses as a percentage of total wages as the 2000 Budget Scenario. Indexing pensions at half the rate of annual increase of average wages will result in a manageable scenario during most of the next twenty years, but it will result in a significant increase in social expenditures as a percentage of total wages by 2020. Making future population projections should be reserved for very old researchers. These projections are almost invariably found to be wrong, and the researcher who made them is likely to have his intelligence and wisdom questioned by those who review his work in the future. Making estimates of future costs and incomes using population projections only multiply the likelihood of error, so this author caveats the discussion so far by saying that using the previously discussed figures for any purpose other than to alert others to potential problems is a highly suspect enterprise. The CELADE population estimates are as good as they come but they will meet a real world test once the results of the 2002 census become available. They are definitely an improvement over ONE’s population estimates that appear to have been frozen in time, and show illogical transitions from one year to the next. Nonetheless the CELADE population estimates are based on assumptions of births and mortality that can change easily, and although these changes are likely to be reflected slowly in the general population, they will be make a definite impact if they are sustained over a few years of the projection period. The economic variables that were modeled demographically were based on the 2000 Cuban Government Budget. They were not based on actual expenses, and wages and therefore they should be considered suspect. Nonetheless they can serve to analyze relations between wages, and social expenditures assuming that the 2000 budget figures are consistent with each other. • What are the long-term care needs of the aging Cuban population? • What is the political impact of having 25% of the population in retirement? • What are the expenditures required to educate and to retrain the labor age population to make it more productive? • What other sources of income are available to the retired population? • And as the King of Siam would say in the King and I: Etceteras, etceteras, and etceteras. Answering any one of these questions could take an entire series of separate papers, and this author is sufficiently modest to recognize when a topic is out of scope. Nonetheless the author hopes that this paper will encourage other researchers to examine the consequences of the aging of the Cuban population in their respective fields. The author hopes that the reader takes away at least three thoughts from this paper. The first is that if past trends are not reversed, the Cuban population will grow very slowly in the future, and that the average Cuban will be older than today. The second insight is that the aging of the Cuban population requires a reallocation of resources from the young to the adult and elderly population. This reallocation of resources includes changing the emphasis of the educational system, the priorities and services of the public health system, and the level of pension financing. The last thought is that any future Cuban government, regardless of its ideology or its political persuasion, will have to face the challenges posed by the aging of the Cuban population. 3. Centro Latinoamericano y Caribeño de Demografía, July 2000. Boletín Demográfico No. 66. América Latina: Población por años calendario y edades simples 1995 – 2005. Santiago Chile. 4. Ministerio de Finanzas y Precios, 2000. Ley del Presupuesto del Estado para el Año 2000. La Habana.